Members of Wright State’s Student Government picked up trash along a portion of southbound State Route 844 as part of the state’s adopt-a-highway litter program. A crusty and shattered iPad was among the many pieces of garbage that littered the side of southbound State Route 844. Muddied socks and gloves, rusty cans, plastic bottles and wrappings and cigarette butts were also scattered on the side of the road — that is, until Student Government arrived on the scene. 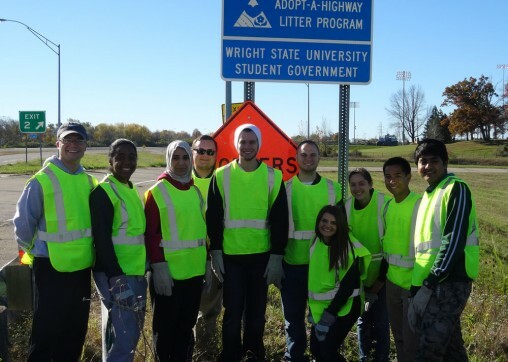 On Oct. 25, members of Wright State’s Student Government donned neon green vests and took to the highway for a little fall cleaning. By the end of the day, the student organization had collected enough garbage from the side of the road to fill 18 large bags. 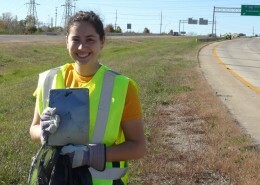 Zena Fadel, director of internal affairs for Student Government, holding up an iPad, one the many items the volunteers found during the cleanup. The student-run organization recently adopted State Route 844 southbound from mile marker 0.0 to 1.6. As a part of the adoption contract, Student Government will clean that stretch of 844 four times each year. “Wright State is well known for the culture of community service that has grown around our university,” said Max McConnell, director of communications and marketing for Student Government. “Student Government thinks that by contributing our time to beautify the areas surrounding our campus, we can support the university’s growth and encourage positive association in our community,” McConnell said.